The 11-year-old donated nearly $2,000 to military non-profits. Frank Cenicola’s fingers have gotten a pretty good workout since we first met him in March. The then-fifth grade student had started a small business called Frank’s Pens with the intention of raising a few bucks with his woodworking hobby. He never expected he’d be putting in so many hours on his lathe. Frank started small in February 2018. He made 76 pens that month using scrap wood from around the house. He sold each pen for $15 and donated $5 of that money to a local veteran-related nonprofit group. It was his way of giving back to the military. “Ever since he was a little guy, he was always trying to do something good it seemed, and I’m very proud of him,” said his grandfather, also named Frank. Now in sixth grade, Frank has created enough pens to donate $1,975 to military causes. His March donation of $910 to Post 9/11 Veterans helped provide a pair of $500 scholarships to two Bay area veterans to attend college classes. One of those veterans is Ashaley Boatwright, who is studying at Stetson Law School in Gulfport. He joined the Marine Corps in 2007 and was deployed to Iraq in 2008 and Afghanistan in 2010. He spent four years in the military. After learning that part of his law school tuition was paid for by an 11-year-old in Wesley Chapel, Boatwright decided to pay Frank a visit. The duo started making pens together in Frank’s garage. They made 29 in a 10-hour session. Frank has donated to many different organizations, including Wounded Warriors Foundation, Post 9/11 Veterans, Stephen Siller Tunnel 2 Towers and VIP Warriors. 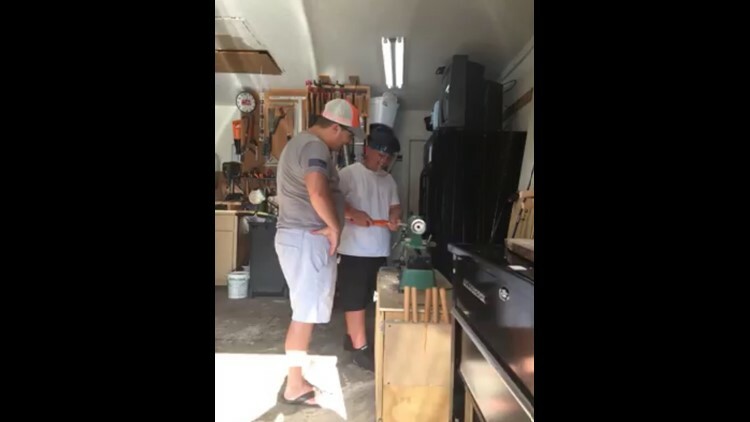 Frank learned how to work with wood from his dad, Scott. The two went to a convention three years ago and it sparked Frank’s interest in the craft. He decided to donate to military efforts because of his grandfather, who served in Korea from 1955 to 1957 as a member of the U.S. Army. Frank has received encouragement and orders for pens from all over the world. A teacher at his school sent a pen to a family member in Hawai’i who also makes wooden pens. He mailed Frank a few exotic wood samples from the island. Frank has gotten inquiries from as far away as Japan. Frank hopes to donate more in 2019 than he did in 2018. To order, visit Frank’s Pens on Facebook or email frankspens116@gmail.com.